Most of the information published through graphic media is designed for people with normal eyesight. There are 285 million people with visual impairment. This number indicates a need for adaptation of the printed media targeted towards this population. World Institute for visually impaired people recommended guidelines for the design of graphic media customized for people with partial blindness. Most of the previous research related to this topic is mostly based on guidelines and characteristics of English and French language in order to enhance legibility of the text for people with low vision. This paper is trying to access the level of legibility of the text for Croatian readers with low vision by analysing parameters such as typeface and letter size, the size of punctuation marks, highlighting style, letter colour and background colour in order to suggest practical guidelines for text design within graphic medias intended for this group of readers. Seven participants from The Zagreb Association for the blind were involved in this study with remaining vision of 2-5% along with additional eye defects. According to the collected results it is shown that the relation between letter colour and background colour, or better yet contrast has the strongest influence on legibility for people with low vision. Letter size has a weaker impact and the least impact has the type of the font. The best way of highlighting text is using bold style. The magnification of punctuation marks does not improve legibility. Guidelines for designing printed media on Croatian language for people with low vision can be useful in order to enhance their ability to get information in a same way as other members of society. BROZOVIĆ, Maja et al. Guidelines for designing text in printed media for people with low vision. 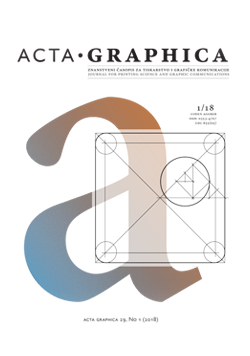 Acta Graphica, [S.l. ], v. 29, n. 1, p. 25 - 30, dec. 2018. ISSN 1848-3828. Available at: <http://actagraphica.hr/index.php/actagraphica/article/view/154>. Date accessed: 23 apr. 2019. doi: http://dx.doi.org/10.25027/agj2017.28.v29i1.154.